Even though it’s been twenty years by now, I can still distinctly remember my very first period. I HATED the feeling of those plasticy, sweaty pads stuck to my underwear. I was desperate to try something else even then. My mother tried to scare me with stories of TSS and irremovable tampons, but I didn’t care, I just wanted to be comfortable. Later, I switched to cups, and then… reusable pads. I had no idea that they would feel that much better than the disposable kind, but they absolutely do. Seriously – believe the myth. I tried one, and then ordered a dozen. I have been using the same brand for around eight years now, so I’m definitely a convert. And after one too many dashes through the rain to find Jo some pads, I was determined to make her into one as well this summer. Disclaimer: Our pads are bought from Mimi’s Dreams on Etsy. We have received no compensation for this review, we just genuinely love these! It’s true, Nele has been trying to convince me for ages. I’ve always thought that things are alternative for a reason though. I assumed they wouldn’t be good enough to deal with a heavy flow, or that they would be awkward or messy. So I said ‘yeah sure, I’ll try them one day’, until she got tired of me procrastinating and gave me few as a welcome to Belgium present. So when I got my period this summer, instead of reaching for the plastic rustle of a disposable sanitary towel I grabbed one of my new brightly coloured reusable pads instead. The first thing I noticed is how secure they felt. Even when using sanitary towels with wings I’ve always struggled to keep them in the exact right place, I usually have to do that awkward shuffling dance to try and get it to sit just right. But because the reusable pad is cotton it stays exactly where I put it and it feels comfortable to boot. I did worry about leaks so I went to the bathroom way more often than I normally would, but the pad seemed to be handling my flow just fine. The next thing I wasn’t sure about was the whole washing bit. It was easier than I thought though. When I changed the pad, I put it in a tub of cold water with a little detergent and left it to soak overnight. The next morning I tipped out the water and looked in amazement as all of the blood had just disappeared down the drain. I soaked the pads for the duration of my period and at the end of the week popped them into the washing machine with a load of towels. They came out all shiny and clean! It wasn’t long before I was sitting next to Nele at her computer ooh-ing and ahh-ing at the other prints that Mimi’s Dreams has in stock. 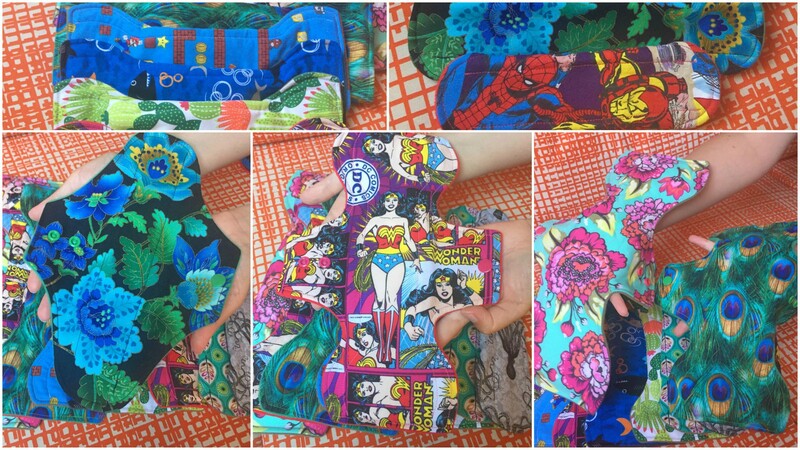 There is a stock of ready to buy pads but I was more excited by the fact that she also creates custom made ones in the size and fabric you want. Because they are custom made and there is international shipping involved they took about three weeks to get to us but it was well worth the wait. The prints look just as amazing as they did on the site, and I now have a reusable pad emblazoned with a Super Mario level, it amuses me to no end, I sing the theme tune to myself every time I see it. It’s now been two months and two more cycles, and I have to admit it – I’m hooked! Who knew periods could be so much fun? I think it depends on how long you travel. If it’s only a short trip of a few days you could do it, they sell wet bags to store the pads in after use, and then you can wash them at home. If it’s any longer it really depends on where you are, if you have easy access to a washing machine it should still be fine, but if not or if it’s somewhere more tropical I too have resorted to buying the disposable ones. Cups are very handy as well for travel, I love mine! Especially for hot climates. Regardless of travel, I think it’s still worth the investment even if you’re only planning on using them at home. That’s still a lot of cycle days where you’re not throwing anything away or having to buy new pads for, they end up paying for themselves.